40% of food in America goes uneaten—it’s an almost unbelievable fact. Here in New York City, around 20% of our waste stream is food waste. For decades, this food waste has been sent to landfills where it produces methane, a potent greenhouse gas and large contributor to global warming. Instead of sending all this food to landfill we want to first prevent, then recover, and finally recycle any remaining food. In recent years, New York City has shown incredible leadership on food waste recycling, and our apple cores and potato peels are starting to meet a better end. Back in 2013, City Council passed two laws to jump start the recycling of food waste. These laws established a curbside organics collection pilot and organics diversion requirements for businesses. My colleague Eric Goldstein has written about the residential program and commercial requirements, if you want to learn more. In the years since, New York City Department of Sanitation has been hard at work implementing these two laws. And it shows—with three great examples in the last few weeks alone. First, as of yesterday, the New York City curbside organics collection program serves 2 million people, making it the largest program of its kind in the country. By the end of this year it will serve 3.3 million people and by the end of 2018, all NYC residents will have access to curbside organics collection or to a convenient drop off location. This is no small feat and the city’s leadership and dedication on this issue will help drive development of food recycling infrastructure and hopefully inspire action by other cities as well. Second, just last week, the NYC Commissioner of Sanitation Kathryn Garcia announced a proposal to dramatically expand the number of commercial food establishments required to separate their organic waste and send it for beneficial use. Currently the largest 350 or so commercial food establishments are required to separate their organic waste, but this new proposal will add approximately 2000 businesses. Department of Sanitation estimates this will increase diversion of organic material from the commercial sector to 50,000 tons a year. Third, New York City’s Department of Sanitation’s Foundation for New York’s Strongest hosted the first NYC Food Waste Fair yesterday. 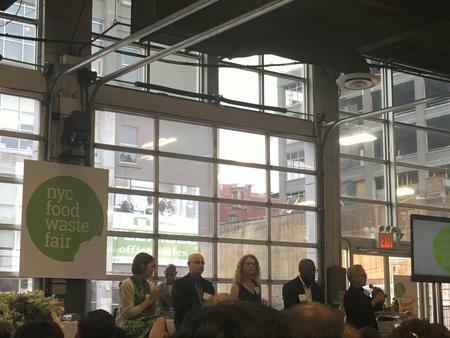 The Food Waste Fair—with more than 1000 people in attendance—sought to equip NYC businesses with the tools to address food waste. There was a great panel on food waste policy (including my colleague Mark Izeman, city staff, and experts), workshops for businesses, and dozens of exhibitors.